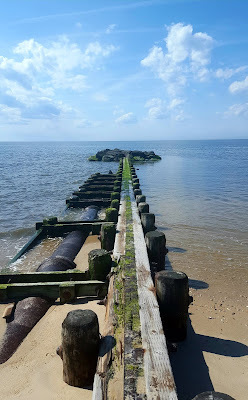 The lecture on depth perception reminded me of this photo I took at the bay in North Cape May. It shows examples of monocular cues, like the photo of the railroad tracks we viewed in class. The walkway in the center appears to decrease in size as it approaches the horizon, when in reality we know that it is because it is farther away, called perspective convergence. The walkway and objects surrounding it seem to converge at its end point, the jetty in this case. The supportive wood structures on the sides of the walkway appear to become increasingly closer together as they approach the horizon, called texture gradient. The linear wood structures above the pipe appear to be doing the same. The distance between them appears to decrease as it reaches farther away from our point of view. Lastly, although we know the jetty rocks are bigger than the wooden structures, the rocks appear much smaller. This is because they are farther away, called relative size. We know they are farther away, because they are right below the horizon, higher in our field of vision, called relative height.